Nim and Lil found a bag of smarties while searching for food coloring in the kitchen. Smarties were made almost entirely of sugar. Smarties were one of their favorite foods. Second only to sugar. They spent about 10 minutes gobbling up over half the bag and were now in the midst of the biggest sugar craze since ’91 when Flakey downed two bottles of pure maple syrup. That had not ended well. In his sugared state, Flakey had destroyed the Christmas tree in his family’s home. Ornaments, tinsel, lights and pine needles littered the living room floor–a few pieces of tinsel even made it into the dog bowl. He would have lost his scouting privileges had the family not thought the whole mess was hysterically funny. Good thing Santa has a sense of humor too. “Watch this!” cried Nim, bombing the tree with smartie wrappers. 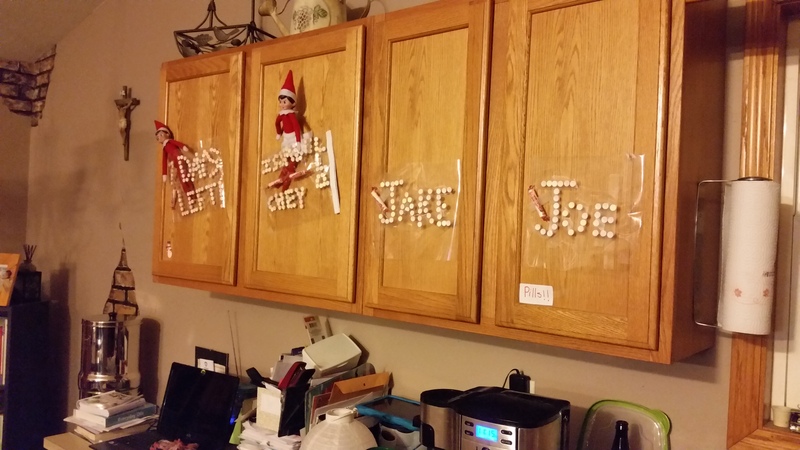 Lil was in a frenzy, tumbling head over feet through the air, knocking over any Santa nesting doll or snowman that was in her path. They sobered a bit when Joe’s mom came into the living room. She must have heard them because she looked around the room, too groggy to really see anything. After she stumbled back to bed, Nim and Lil breathed a pepperminty sigh of relief. 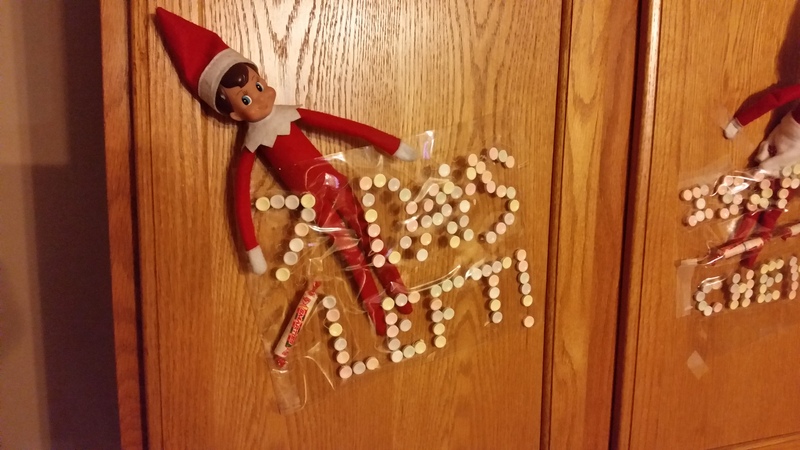 “I guess we had one too many smarties,” Lil chortled. Mad laughter threatened to overtake them once again. Luckily, Nim spied a few spare smarties on the counter in the shape of a circle and formed a plan. Nim let a little giggle escape as he flew to the desk to get supplies. “You spell the girls’ names and I’ll take care of the boys,” he said, throwing her a roll of tape and a few packs of smarties. A hill of wrappers and a few minutes later, Nim and Lil stood back to admire their handiwork. Satisfied with the results, they fluttered to their places and tucked in for the few hours until morning. “Do you think the moms will be mad about candy so early in the morning?” asked Lil. “Oh probably,” said Nim impishly.